"Between the Mediterranean and the Atlantic, Europe and Africa, Morocco has always been a land of exchanges and encounters. Berber, Arab, Jewish and Christian cultures have learnt to live together. Each has contributed its genius, making Morocco a land of tolerance and shared beauty." Morocco's climate is moderate and subtropical, cooled by breezes off the Mediterranean Sea and Atlantic Ocean. In the interior the temperatures are more extreme, winters can be fairly cold and the summers very hot. 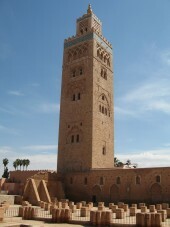 Marrakech has an average winter temperature of 21ºC (70ºF) and summer temperature of 100°F (38°C). In the Atlas Mountains temperatures can drop below zero and mountain peaks are snow capped throughout most of the year. The winter in the north of the country is wet and rainy, while in the south, at the edge of the Moroccan Sahara, it is dry and bitterly cold. Air RAM (Royal Air Maroc) operates domestic flights from Casablanca to major cities nationwide. 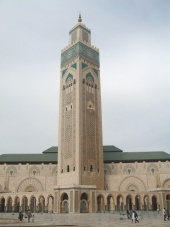 Between any other two points, you will usually have to change planes at Casablanca, unless both points are stops on a single Casa-bound flight. In general flight are expensive, but will save you a lot of time. Sea: Car Ferry Services are available from Algeciras to Tangier as well as from Sete, France to Tangier. Passengers can also be ferried from Gibraltar to Tangier. Further information may be collected at the Moroccan National Tourist Office. Train: The trains in Morocco are very comfortable and fairly inexpensive. They cover a limited network of routes, but travel between the major cities they are easily the best option. They are reliable, comfortable, fast, and efficient. Shared Taxi: The Shared Taxis are one f the best features of Moroccan transport. They operate on a wide variety of routes and are much quicker than the public buses. The fares are very reasonable. The taxis are usually big Mercedes cars carrying six passengers. Bus: Buses are usually cheaper than the shared taxis and they do more regular routes. Shared Taxis will bring you to your destination much faster, but the buses are far more comfortable and safer. Car: There aren?t many problems driving by car in Morocco. The speed limit in town is 50km/hour and outside town on the highways it is 100km/hour. By law all drivers and passengers are required to wear seatbelts. However you should be careful of driving at night. It is legal to drive without lights at up to 20km/hour, but there are many cyclists, animals and hikers at night. There are many car rental depots, though you should have insurance, and they are very expensive and the petrol prices in Morocco are fairly high. Motorbike: Motorcycling in Morocco is increasing each year. Although you should be careful of your safety at night, you will be able to visit all the sought after places for the enthusiast. It will be advisable to take a good tool kit and puncture repair kit. VISAS: Required by all except the following: Nationals of Britain, Australia, Canada, USA, Other EU, Japan. Nationals of Andorra, Argentina, Bahrain, Brazil, Chile, Congo (Rep), C�te d�Ivoire, Guinea, Hungary, Iceland, Indonesia, Korea (Rep), Kuwait, Libya, Liechtenstein, Mali, Malta, Mexico, Monaco, New Zealand, Niger, Norway, Oman, Peru, Philippines, Puerto Rico, Qatar, Romania, Saudi Arabia, Senegal, Singapore, Switzerland, Tunisia, Turkey, United Arab Emirates and Venezuela for stays of up to 3 months. The climate and general conditions of Morocco shouldn't pose a rick to most healthy people. The Atlantic Coast however will pose a problem for asthma sufferers, rheumatism and people who have liver problems. Due to the extreme heat during the summer months, it is recommended that you keep plenty of water and fruit on your person. Though most water in Morocco is safe for consumption, you might want to use them in the southern regions of Morocco where bilharzias and schistosomiasis has been a problem in the past. Never drink from mountain streams unless a local says it is safe to do so. The purification tablets are also handy for bartering with Moroccans living in isolated areas. Many classified hotels support credit cards and most major banks have ATM machines. Traveler's checks can be quite useless as they can only normally be exchanged at the bank which makes them an inconvenience for the average person in Morocco. 220 volts AC, 50Hz. Some areas have a DC supply. Plugs used are of the round 2- and 3-pin type. In 788, about a century after the Arab conquest of North Africa, successive Moorish dynasties began to rule in Morocco. In the 16th century, the Sa'adi monarchy, particularly under Ahmad AL-MANSUR (1578-1603), repelled foreign invaders and inaugurated a golden age. In 1860, Spain occupied northern Morocco and ushered in a half century of trade rivalry among European powers that saw Morocco's sovereignty steadily erode; in 1912, the French imposed a protectorate over the country. A protracted independence struggle with France ended successfully in 1956. The internationalized city of Tangier and most Spanish possessions were turned over to the new country that same year. Morocco virtually annexed Western Sahara during the late 1970s, but final resolution on the status of the territory remains unresolved. Gradual political reforms in the 1990s resulted in the establishment of a bicameral legislature, which first met in 1997. Lower house elections were last held in September 2002, while upper house elections were last held in September 2006. The Almond Tree Festival, Tafraoute, Morocco is an annual event that takes place in the month of February. The tiny village of Tafraoute is known as the “almond capital” of Morocco and the Almond Tree Festival is a celebration of the gregarious blooming of the hundreds of almond trees that dot the landscape of Tafraoute. The Ashura Festival, Morocco is the most important of the Shia Muslim Festivals. It takes place on the tenth day of the holy Muslim month of Muharram and is observed in remembrance of the martyrdom of Imam Hussein at Karbala, approximately thirteen centuries back. Prophet Imam laid down his life in pursuit of the position of Caliph. The Asilah Arts Festival, Morocco is an annual cultural extravaganza that takes place in the first two weeks of the month of August. Both studio and performing artists from all over the world, painters, musicians and dancers gather at the Asilah Arts Festival imparting the setting with color, exuberance and dynamism. The Celebration of the Throne is an annual event observed on July 30 and marks the accession of King Mohammad VI to the throne. It is also the most important of the Morocco Festivals & events. The Essaouira Music Festival, Morocco is also known as the Essaouira Gnaoua and World Music Festival. This is a grand musical extravaganza that celebrates the mysticism and spirituality of Gnaoua music along with its numerous offshoots like the Haitian Voodoo and the Brazilian Candomble. Indian classical music, Judaic sacred music, Sufi devotional songs, Spanish gypsy songs: this is the eclectic entourage at the Fez Sacred Music Festival, Morocco, which is held every year from 1st to 10th June at Fez, the spiritual capital of Morocco. Goulimine is a little town at the edge of the Western Sahara. This is the site of several camel fairs all throughout the year. There is a Goulimine Camel Fair every Saturday, besides a huge annual Goulimine Camel Fair held in the month of June. The yearly Goulimine Camel Fair, Morocco, one of the most famous of the Morocco fairs, attracts caravan dwellers and tribes like the Tuaregs, the Rguibat and the Fulanis from far flung areas in the Sahara like Niger and Chad. The Date Festival, Morocco is one of the most popular of the various Morocco Festivals & events and is held in the month of October in the northern town of Erfoud. It is a three-day long Festival.